“We don’t all agree on every issue surrounding homelessness, but we found common ground in wanting to help others,” says foreman Don Dockter, ’72, whose front yard served as the construction site. It’s routine to encounter construction all over Seattle, but a bite-sized house built above Shilshole Bay inspires passersby to stop and take a closer look. It resembles a storybook abode complete with a gabled roof and flouncy curtains adorning the single window. It also draws looks because of the color scheme—shades of purple—and the oversized “W” under the arch. A passing driver rolled down his window. “Whose house?” he playfully inquires. The din of pounding hammers and table saws momentarily ceases. The building crew—all retirees outfitted in tool belts and Husky colors—simultaneously answer. “The Dawg House!” they roar in approval. During a single week in May, a group of more than 20 UW alumni built the tiny house as shelter for local homeless populations. Don Dockter, ’72, laid the groundwork. He was inspired after volunteering to “pound a few nails” as part of a friend’s tiny-house project, and envisioned the possibilities of a Dawg House version. The retired salesmen pitched the idea to “The Whizzies,” his close group of college friends who met as Haggett Hall roommates more than 50 years ago. The response was overwhelming. More than 20 Whizzies donated the needed $2,500 in addition to committing blood, sweat and beers to make the tiny house a reality. The tiny-house structures are no larger than 8-by-12-by-10 feet. The Whizzies based their version on existing models with utilitarian features such as a plywood bunk bed, built-in table and clothing rod. To give the house a sense of home, a few flourishes included a set of plate and cups along with curtains and placemats sewn by Dockter’s wife, Donna. 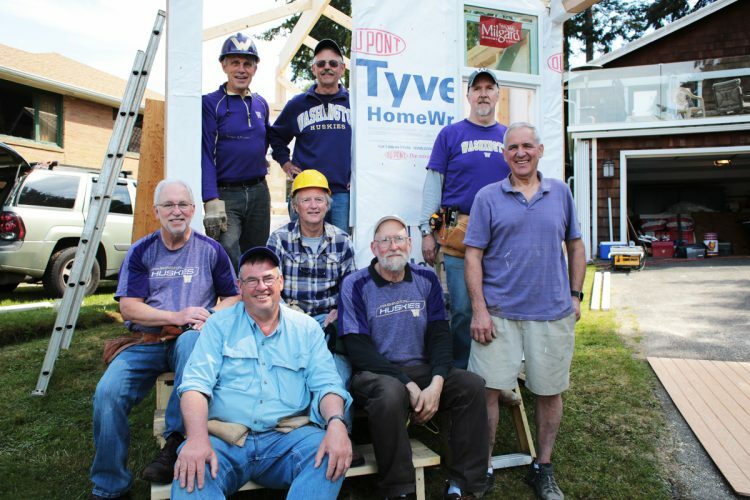 Don Dockter, in the purple hardhat, recruited his Husky friends to join him in building a UW-styled tiny house for a village serving those less fortunate. The crew included Dockter, ’72, Kent Dimmitt, ’71, Craig Popp, ’70, Steve Burnett, ’76, Greg Ferguson, ’71, ’73, Dale Hoff, Karl Graf, ’72, ’77, Jack Collins, ’70, ’74. The Dockters’ front yard served as the construction site and out-of-town Whizzies stayed at the main house, where they shared nightly, home-cooked meals. Other than the 8 a.m. start time, “it was almost like living in the dorm again!” Dockter laughs. Karl Graf, ’72, was designated “Head Honcho.” He worked as a house builder during college before earning a degree in electrical engineering. Everyone brought tools from home and makeshift saw horses dotted the driveway while sawdust sprinkled the lawn. Construction progressed quickly with the basic structure completed, siding installed and roofing finished by the second day. There were often twice as many volunteers as expected and it became a multi-generational affair including children and grandchildren. “There is the formal, book aspect to any education. But equally important—maybe more so—is the life learning. The UW created an environment that instilled in all of us a sense of responsibility to give back to our communities,” Graf says. Whizzies traveled from as far as Spokane and Portland to participate. Everyone has witnessed homelessness in their respective communities. Some group members have personally known and been affected by loved ones struggling with housing instability. The Whizzies’ house was completed in about a week’s time and will be donated to a Seattle tiny-house village operated by the Low Income Housing Institute (LIHI). LIHI is an advocate organization and provider of homeless services to the Puget Sound region. It oversees and provides additional basics—such as electricity, common-area kitchens, restrooms and more—to the tiny-house villages. There is already discussion for the Whizzies to build another tiny house and perhaps make it an annual tradition along with their yearly July 4th gathering and Christmas calendar. The inaugural project was a tiny house with a big heart. Craig Popp, ’70, put his environmental design degree to good use and made a sign to hang at the thresh hold. Built by Washington Whizzes emblazoned with a rising sun welcomes visitors.